My mum was always happy in the kitchen too and I remember her making everything from scratch - preserves, jam, baking etc. She also has memories of her grandmothers cooking, but her grandmother was very strict, so that would ruin a 'foodie' memory in my opinion. Food will always be a language of LOVE and JOY to me !!!. As a child a typical winter dinner consisted of soup, followed by a main dish and then dessert..every night !! and they were lovely puddings too, like Raspberry Tart, Caramel Meringue Pie, Steam Puddings and in the summer, simply fresh strawberries, sprinkled with icing sugar and lots of whipped cream on the side....mmmm..its a wonder we all warn't as wide as houses lol..but maybe the long daily walk to school took care of that. Anyways.. I'm probably more like my nana when it comes to food, because like her, I also enjoy entertaining and love to cook for family and friends. There's nothing more fun for me than planning a 'theme night' special dinner with friends. My hubby organises the music and we always have a wonderful time, finally closing the night by sending the guests on their way with a little something extra, like more dessert, vegetables from the garden or some homemade preserves. I love making pesto and normally make about 4 jars at a time and freeze it, as its fairly expensive to buy in the supermarket (about $6.00 for a small pottle). 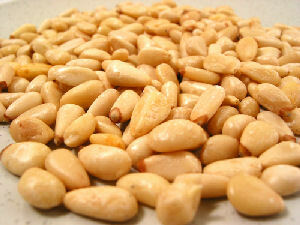 Most recipes use pine nuts, but as they cost about $50.00 a kilo in NZ, I normally use raw almonds or raw cashews. Pine nuts do make a more decadent pesto though because of their oily waxy texture, so I would save them for special occasions. Pick all the leaves off the basil. If it needs washing, go ahead and then put it through a salad spinner until dry. Add about half of the basil leaves, the garlic and the nuts to a food processor. Chop until fine, then add the rest of the basil and pulse until finely chopped. If using a small processor like mine, it will need to be done in batches. Transfer to a bowl if making a large quantity, or if the processor has a small bowl. The add the finely grated parmesan. ...gradually drizzle in the measure of Olive oil, and the salt. Stir with a whisk and mix until the desired consistency is acheived. Then voila here it is :0) YUM !!! 1. Crack the egg(s) into a food processor, and add roughly half the flour. Process for about 15 seconds until the mixture becomes a gummy, sticky mess, then process for another 30 seconds. 2. Add the remaining flour 1/4 at a time, processing for 20 seconds each time to fully incorporate. 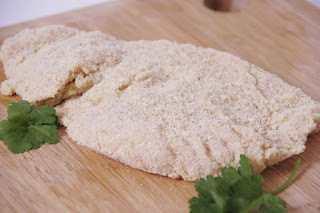 Once all of the flour is added it should take on the consistency of coarse breadcrumbs. 3. Turn the mixture out onto a board and push it all together - kneading - to form a ball. Wrap in plastic wrap and stand for 30 minutes before using. 4. Cut the dough into thirds and cover the remaining dough. Sprinkle flour on the one third you are using. Start with the lowest setting on the pasta machine and pass the dough through, Sprinkle with more flour if necessary. Keep on upping the dial, one notch at a time, and flouring the dough as you go...until you get this.. I used some spelt flour too, so thats why mine looks a little grainier. Then fit the fettucine/spaghetti attachment and pass the thin dough through it. I loosley pile it into little mounds and sprinkle a light dust of flour through. It can be air dried slightly first (I hang it over a broom handle, between 2 chairs or whatever innovative means you come up with). Maybe make shorter strands if drying it. This quantity makes enough for 4 people as a main, or 7-8 as a side dish. If its been air dried, pack it carefully into plastic bags and freeze. 1. Cut the chicken breast in half. 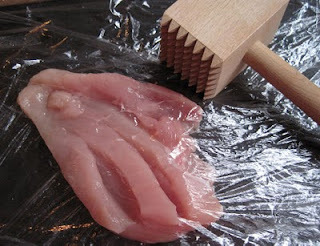 Lay the chicken between a layer of cling film (top and bottom). Whack with the flat side of a meat mallet, until about 1/3 inch thick. 2. Dip the fillets into the beaten egg mixture to coat both sides. 3. 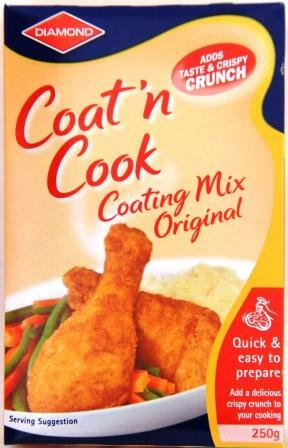 Dip into the coat and cook or breadcrumbs on both sides. 4. Heat the oil, and add the fillets. Turn the snitzels over when the snitzels have whitened around the edges and lightly browned. 5. Cook about 8 minutes more. Check to make sure its cooked all the way through, but still juicy. 6. Drain on paper towles. This makes 1 chicken breast go a bit further. 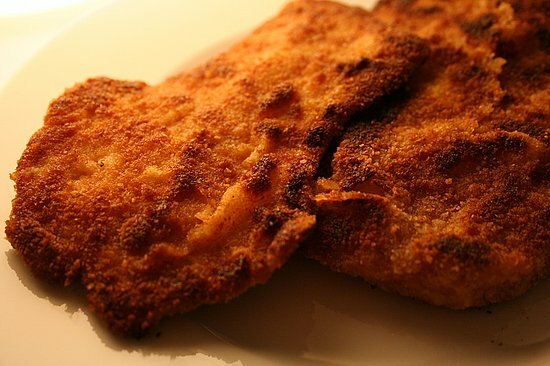 These snitzels can be served with many different things, a baked potato, the noodles and pasta, or just a simple salad. Some dried Coriander seeds from last summer. I've planted some in pots..so I'm praying they will sprout !!! Oh Wow Lindy...you are going to be famous and I can say "I knew her when...."
Congrats Hun' and if I could get my back to work better than it does I may even be tempted to have a go at your recipes. thanks JO, so glad you stopped by xoxo I will pray for you regards your back !!! I love your blog and especially loved what you wrote about Nana. In fact I still have an apron of hers. She was so special and I think that she influenced us all alot more than she would have realised. Hey Christina, I havn't logged in here much lately so i just saw your comment. Thanks for stopping by and so glad you like my blog :0) Yes we had a wonderful nana..a true blessing to us all. hugz to you ! The best 'Brownies' you'll ever eat !! !